Disaster recovery | Live Healthy S.C.
After a natural disaster like a hurricane or flood, many residents have to undertake the process of cleaning up and disposing of a wide variety of debris from their home and yard. 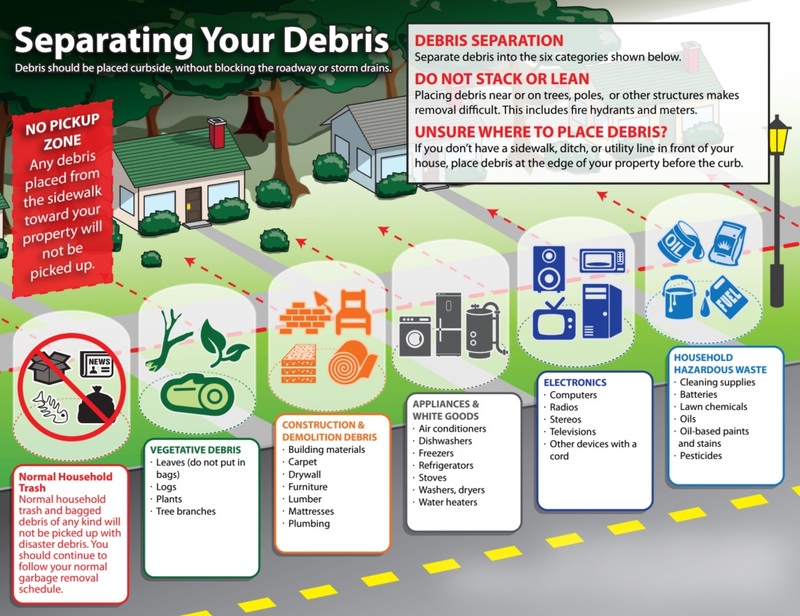 Here are some tips to help storm debris disposal go smoothly. Recycle as much as you can to reduce the amount of waste that goes to landfills. Everything from water bottles to electronics can be recycled at many locations. To find recycling locations and a list of materials accepted, click here or contact your local waste management program. Vegetative debris – Tree branches, leaves, logs & plants. DO NOT BAG this material. Construction/Demolition material – Carpet, drywall, furniture, lumber, mattresses, plumbing materials, shingles and tiles. Appliances – Air conditioners, refrigerators, freezers, stoves, water heaters, dishwashers, washing machines and dryers. Electronics – Computers, televisions, stereos, radios and other devices with an electrical cord. Do not put normal household trash or bagged debris of any kind out for flood-debris collection. Please continue to follow normal garbage removal schedules for regular household trash. Debris should be placed curbside without blocking storm drains or the roadway. If you have or will receive insurance proceeds for the removal or disposal of flood generated debris, do not place on right-of-way for collection. Because of the high volume of debris needing to be collected after the devastating 2015 flooding, SCDOT is assisting municipalities with debris collection. If you have any questions about debris collection, please contact your local waste management program. For more information on disaster recovery public and environmental health topics, click here. This entry was posted in Emergency Preparedness and tagged debris removal, Disaster recovery, flooding, hurricane, natural disaster, Recycling on October 15, 2015 by SC DHEC.